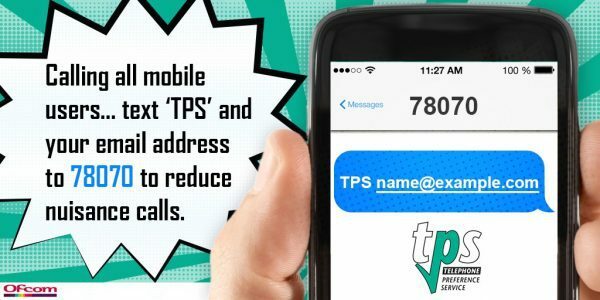 The ‘text-to-register’ service, launched by the Telephone Preference Service (TPS) and Ofcom, enables mobile phone users to add their number to the UK’s official ‘do not call’ database by texting ‘TPS’ and their email address to 78070. To register, mobile customers simply text ‘TPS’, followed by their email address to the shortcode 78070. They will receive a text reply from the TPS confirming their number has been successfully added to its database. Rogue callers operate illegally and against the interests of ordinary people. Texting will make it easier for people to register their mobile numbers on the TPS, which is the only official no-call list, and help us stamp out rogue callers once and for all by giving the Information Commissioner more ammunition to prosecute these cases. Many millions of landline customers already take advantage of the protection the TPS gives against nuisance calls, and we want to ensure it’s as easy as possible for mobile users to do the same. We encourage anyone who wants to reduce the number of frustrating and unwanted calls to their mobile phone to register with the TPS today. Nuisance calls are incredibly intrusive and can cause significant distress, particularly to elderly and vulnerable members of society. Government is committed to tackling this problem, and we have introduced a series of measures that have already seen record fines handed out to combat these rogue callers. This new service from the TPS and Ofcom will help protect people with mobile phones, making it easier for them to register via text and opt out of the call list. If you receive a nuisance call or message, make a complaint. Complaint information helps regulators take action against companies acting unlawfully. If the call is a live telesales call, an automated marketing message, or a spam text message, complain to the Information Commissioner’s Office. You can report spam texts to your mobile network operator by simply forwarding the text to 7726. If you receive a silent or abandoned call, complain to Ofcom. Ofcom’s guides for consumers provide more information.